It shouldn't be surprising to know that AMD, NVIDIA, and Intel (especially Intel) will seed hardware amongst the tech reviewing industry. Most often it goes along with a product launch, but periodically it will be kit that they feel paints their product in a particularly good light. I don't think it's a secret that Ultrabooks and touchscreens have had a little bit of trouble getting off the ground. You could argue that the whole Ultrabook branding scheme, particularly after Intel expanded the definition, was more a way of renaming and redefining the notebook than anything. That it happens to be trademarked by Intel and thus AMD cannot have an Ultrabook is, I'm sure, just a coincidence. 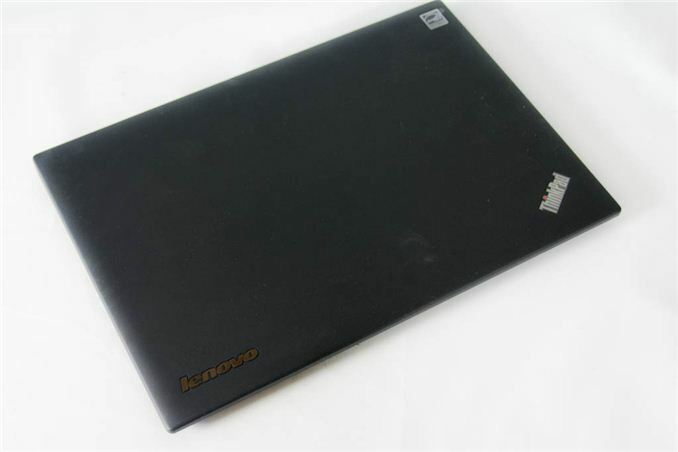 We've had a lot of good Ultrabooks come through, mostly at the 13.3"-and-below scale. The problem the majority suffer from is a a simple one: Intel's initial definition of the Ultrabook basically aped the MacBook Air, and so that design language essentially became the order of the day. Ironically it was really only Dell and HP that had the audacity to tinker with the specs and color around the edges, but with the ThinkPad X1 Carbon, Lenovo has produced something that is unique. It's a 14" Ultrabook, but it hopefully heralds more of the kinds of designs we can look forward to in the 14" and up Ultrabook bracket. Dimensions 13.03" x 8.9" x 0.74"
I understand the enterprise sector often lags a little bit behind the consumer sector; new hotness typically needs to be proven reliable before it can get shipped to the more demanding business environment. 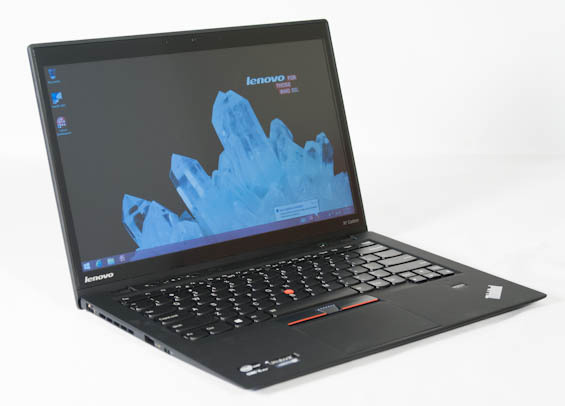 For the most part the ThinkPad X1 Carbon is as modern as a notebook can be until Haswell arrives, but there are one or two oddballs. The Intel Core i5-3427U is a respectable CPU and difficult to find fault with, sporting a healthy 1.8GHz nominal clock that typically bumps up to 2GHz under sustained load, yet Lenovo is stingy with the memory. If you want 8GB of memory, you have to buy their top end $1,759 model; it's not even an upgrade option on the lesser models, where you're stuck with 4GB of memory. 4GB of DDR3L-1333, not DDR3L-1600 like Lenovo's competitors are shipping. Thankfully, while Lenovo's site states the X1 Carbon is limited to one DIMM, the memory is operating in dual channel mode. Given the X1 Carbon's enterprise aspirations, the SSD is Intel kit; the specific model number isn't readily available, but it supports SATA 6Gbps and features the odd 180GB capacity. Most of what's included with the X1 Carbon is as you expect, though the high resolution display is welcome. Note that while it's listed as being glossy, the glossy coating is actually a mild one; it's too glossy to really be called a true matte display, but it's not the nightmare of reflectivity that most glossy displays are. Finally, thankfully, wireless connectivity includes 5GHz. It still baffles me how in 2013 anyone can ship a notebook without this. While it comes down to personal preference between OS X and Windows 8, the jury is still out on whether a vertical touchscreen on a laptop is the way to go. I think its way overpriced considering that in most specs, the Mac beats it (flogs it in display) and costs less. And I still don't get why PC makers have separate USB2 and 3 rails, surely if Apple can afford 2 USB3 ports, then so can Lenovo. Yes the comparison to the MacBook retina is devastating. Unless one considers that the 13" retina is a bit of a flawed piece by itself, annoyingly obviously lacking the power to support its awesome display.